Sealodge Beach is hidden away at the foot of a large ocean bluff known as Kaweonui Point (pronounced Kah-way-oh-new-ee). 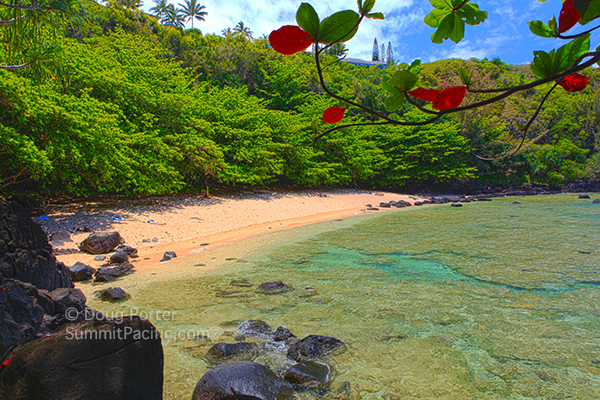 Kaweonui is also the Hawaiian name of the beach but because the most popular trail down begins at Sealodge Condos the beach is more often referred to by the name of the condos. It should be noted that giving modern names to ancient Hawaiian places is frustrating to native Hawaiians, cartographers, and self-proclaimed purists like myself. The public access trail to Sealodge Beach begins in front of Building "A" at Sealodge and takes 10 to 15 minutes to hike. It's steep, rocky, and narrow and gets very slippery when wet. The trail follows a small ravine down to the ocean - crossing a trickle of a stream before descending some wooden steps that help with the steepest parts. Once at the bottom, the trail follows the shoreline as it wraps around the point to the west. The last 40 yards is a scramble along the edge of a black lava rock ledge just above the bay. The trail isn't too difficult unless you have mobility issues or are bothered by heights, or if you are carrying 30 pounds of gear like I was. If you attempt this trail after a rain storm, all bets are off because it turns into a very long and dangerous slip-and-slide and could be disastrous. Kaweonui or Sealodge Beach is about 100 yards wide and is protected from wave action by a very large and broad reef that extends 200 yards into the ocean. On a busy day it might have 10 to 12 people on it. It has ample shade and is a good beach for reading a book, sunning, or taking a nap. It is also a good beach for collecting small sea shells. Of course there are no facilities here. Be sure to bring what you'll need with you, including water to drink. You should also remember to bring mosquito repellant and sunscreen. If you carry anything down, be sure to pack it back up when you leave. Snorkeling at Sealodge Beach is good with a variety of fish and lots of honu or Green Sea Turtles to see, especially if you get out to the edge of the reef. However, this should only be attempted when the ocean is calm. You also need to be aware of the tides. 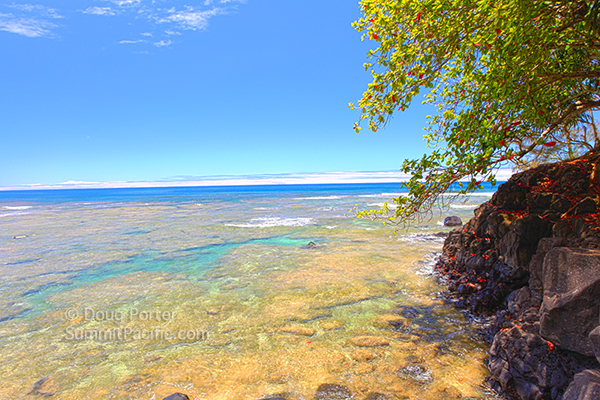 At their lowest, it isn't even possible to snorkel on top of the reef. Please take precautions to minimize contact with corals as they are fragile. Scientists at the Hawaii Institute of Marine Biology at the University of Hawaii are currently studying a recently discovered disease that is destroying coral reefs and threatening the wildlife on the north shore of Kauai and elsewhere around Hawaii (article). Please follow these environmental practices when snorkeling. Warning Sign in Front of Building "A"
A word about parking: All beaches in Hawaii are public, meaning they aren't privately owned. Developers are given the right to build above and around beaches as long as they don't restrict or impede public access to them. Sealodge Condos have a good deal of parking although all the spaces around building "A" are reserved. There are plenty of un-reserved spots a little higher in the lot. As long as you don't park in a reserved spot you should be fine even if you aren't staying at the condos. Just don't leave your car over night unless you are a guest. 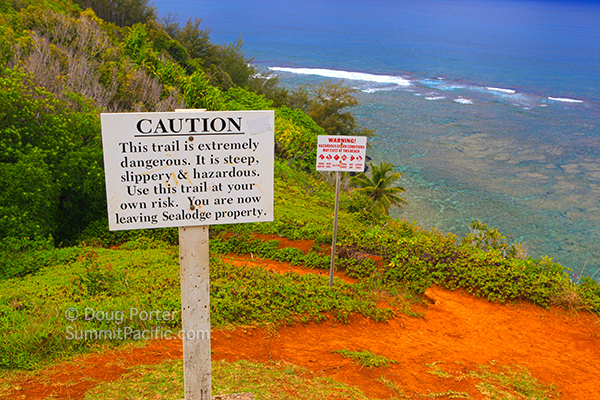 There are several signs at the beginning of the trail warning that the trail can be dangerous and that you can get hurt. You can. They also make it clear that you are leaving Sealodge property. This is mostly to let you know that Sealodge isn't responsible if you do get hurt. 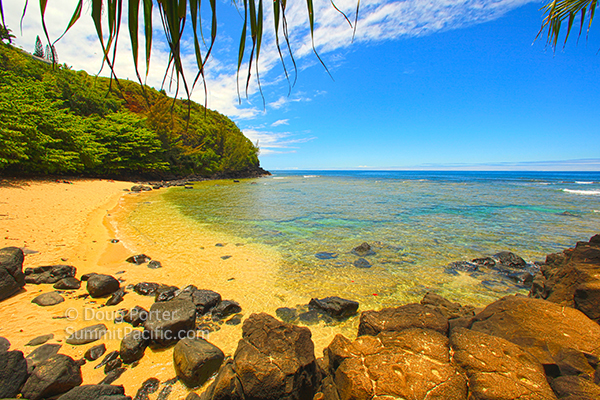 Click for our list of must see Kauai Beaches.